On 27 August 2012, the US National Snow and Ice Data Center announced that the Arctic sea ice extent had broken through the minimum set in 2007. Why is this significant? First, loss of sea ice is a directly measurable consequence of a warming planet. Second, the greater the sea area exposed to incoming solar radiation, the greater the warming effect because ice is highly reflective. Ice loss is one of the key amplifiers of any initial form of warming, whether orbital perturbations leading to the start or end of an ice age, or changes to the atmosphere such as is happening in the modern industrial era. Minimum sea ice extent. 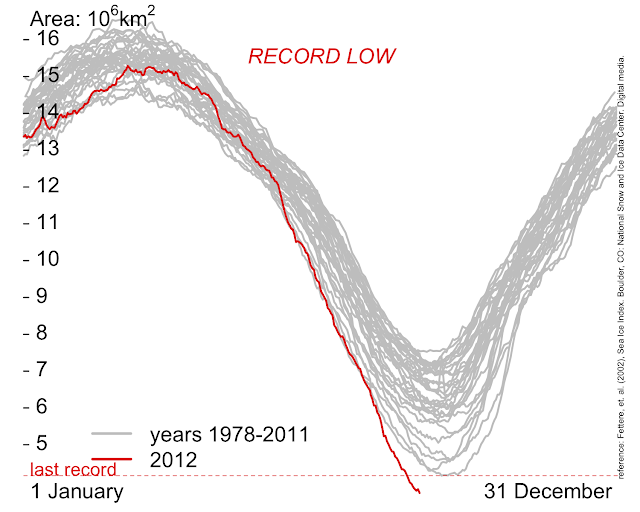 Each grey line represents area of sea ice (areas with at least < 15% ice cover are added to the total) over a year; the red line the current year. Graph drawn using R software by Rasmus E. Benestad, posted at RealClimate, from data at the National Snow and Ice Data Center. At time of writing, the area of sea ice was still trending down; we will only know the actual minimum when it starts to increase again. 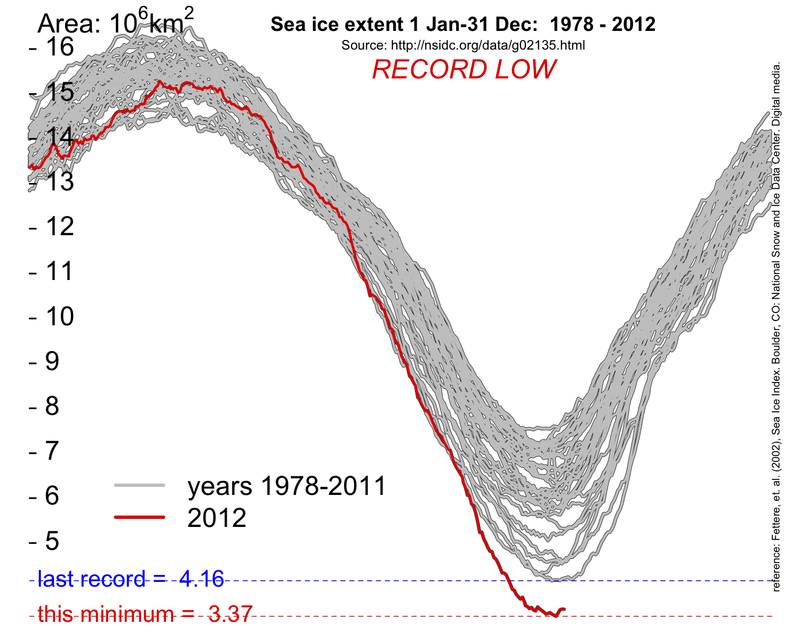 Why should the sea ice extent have hit a new minimum this year? Data so far for the year does not indicate it will be unusually warm by standards of the last few years. None of the short-term natural effects should have a significant impact on temperature averages this year. We have not had a big El Niño, and the solar cycle remains one of the lowest on record, though we are on the higher side of the cycle. The key to understanding this is that the area of ice takes a long time to change, even if the volume of ice is changing fast, because the permanent ice over the Arctic is multi-season ice. If conditions warm sufficiently to melt multi-season ice, it does not melt in one season. Instead, it progressively becomes thinner. 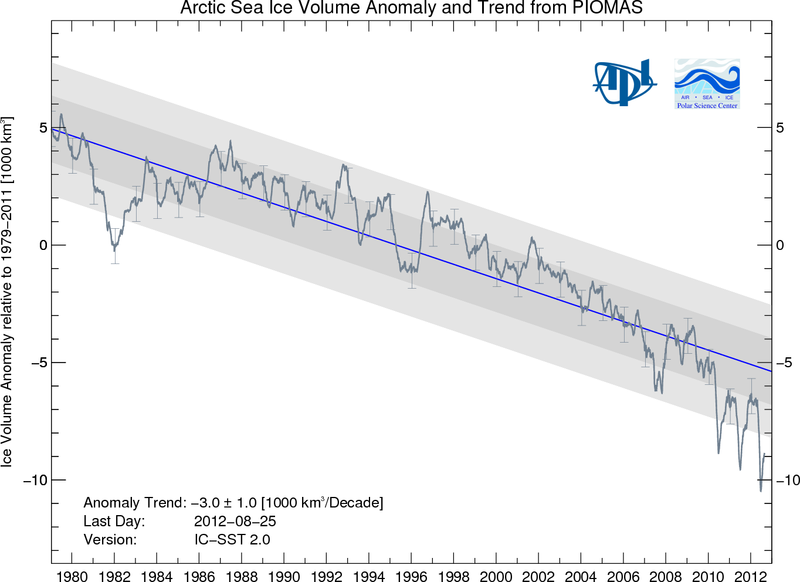 If we look at the long-term trend of sea ice volume, it becomes clearer what’s going on. Total sea ice volume has been trending down steadily, with a sharp increase in the trend in recent years, breaking out of two standard deviations (the grey area) from the trend. How can this be happening if temperatures are not increasingly sharply? First, there’s my point about long-term ice being lost. Once it’s gone, it takes that much less energy to thin the ice further next summer. Also, about 90% of incident solar energy is absorbed by the ocean [Levitus et al. 2001], and ocean heat transport is a significant factor in governing the temperature of the planet. El Niño and La Niña events occur when some of that energy is either released to the atmosphere, or the oceans absorbed a little more than the average amount of energy in the system. Increasing the energy content of the oceans is the big sleeper in climate science: the thing the public doesn’t pay attention to because the numbers look small compared with temperature increases in the atmosphere. The relevance of all this is that a relatively small shift in where that extra energy ocean goes could have a big impact on sea ice. Measuring ocean heat content is very complex because the effect of currents including thermal transport between depths has to be taken into account, and measurement is in a relatively harsh environment, meaning instruments have to be changed frequently, with potential for calibration error. You can’t just stick a thermometer into select parts of the ocean and measure for a few decades as you can on land. But guess what: Arctic ice is turning out to be a pretty damn good thermometer. For more, go here for another interesting article. On 19 September, NSIDC announced that sea ice had appeared to bottom out at 3.42-million km2. I’ve redrawn the graph (22 September 2012 data); it appears to have taken another small dip to 3.37-million km2, 19% below the previous minimum of 4.17-million km2. The script reports the previous low as 4.16-million km2. Possibly NSIDC is rounding the numbers differently, or smoothing the data they report (they generally report numbers averaged over the last 5 days). Either way the difference is slight; the latest record represents nearly 20% below the previous record. Contrast the current situation with a 2006 paper that was widely misrepresented as an alarmist prediction that sea ice would be all but gone by summer 2040 [Holland et al. 2006]. The focus of that paper in fact was demonstrating that a very rapid drop in sea ice is possible over a few years. In the scenario where the Arctic summer was almost ice-free in 2040, it would have taken until about 2030 for sea ice to drop as low as it has this year – and then only as a consequence of one of the abrupt drops the authors claim is possible. In this graph (based on Holland et al fig. 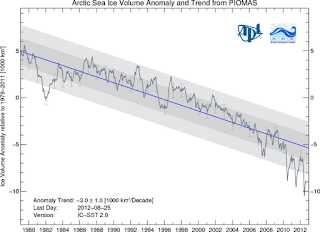 1(a)), based on an ensemble representing seven models (grey bars are the range of values, the black line is representative of the ensemble, the light blue line is smoothed using a 5-year running mean, the red line is real measurements smoothed with a 5-year running mean), the 2012 level of ice has arrived 20 years early – and this is a paper that attracted controversy at the time as being “alarmist”. I compare reality with the smoothed data (light blue line); models like this are not intended to predict annual data accurately. Since the grey bars represent the range of values from different models, you could say that 2012 matches the lower edge of a prediction (one of the grey bars touches my 2012 line at about the right time), but that’s more accuracy than the models should claim. I’ve marked on the graph the 2012 minimum and the point where it intersects the model graph. Note also that the ice level we see today would only have happened in the smoothed Holland et al. ensemble of models after an abrupt drop in ice extent (the grey area of the graph), something that hasn’t happened yet. If their models are correct, and there is a scenario when sea ice extent falls rapidly, the 2040 “prediction” might yet prove to be conservative. There are some who take comfort for the fact that a model such as this is not 100% correct. I don’t see why. There is enormous pressure on scientists in a field where findings have major economic impact not to be “alarmist”, which has a dampening effect on publishing results that predict disaster. If disaster is likely, I’d rather know in advance and have the option to head it off. Those attacking the science, on the basis that it’s not 100% accurate and that the margin of error in predictions includes the possibility that nothing “alarming” can happen, miss miss the rather obvious point that the margin of error includes the possibility that reality will turn out more alarming than predicted. Worse, as reality unfolds on the worse side of modelled outcomes, they continue to deny. one quibble, something that confused me for a while; PIOMAS provides both a volume chart and a volume_anomaly chart. Hank, thanks for that. I wonder why volume anomaly is of interest here. Temperature anomaly makes sense because it allows you to see the delta across different regions with very different baselines, but for ice, there is a clear endpoint, none left, so absolute volume is interesting. And anomaly doesn't scale the problem unless you know the absolute volume.